Most of us have felt this way before! Even the most outgoing of individuals can dread the thought of going to an event where they do not know very many people. It is the perfect place to feel anxious, lonely, and super awkward all at the same time. Are you looking for ways to start conversations, connect with people, and genuinely appear more likable? First of all, stop comparing yourself to Mr. Talkative and Ms. Charming. Although they are socially gifted, they till have to put effort into being likable and conversational! 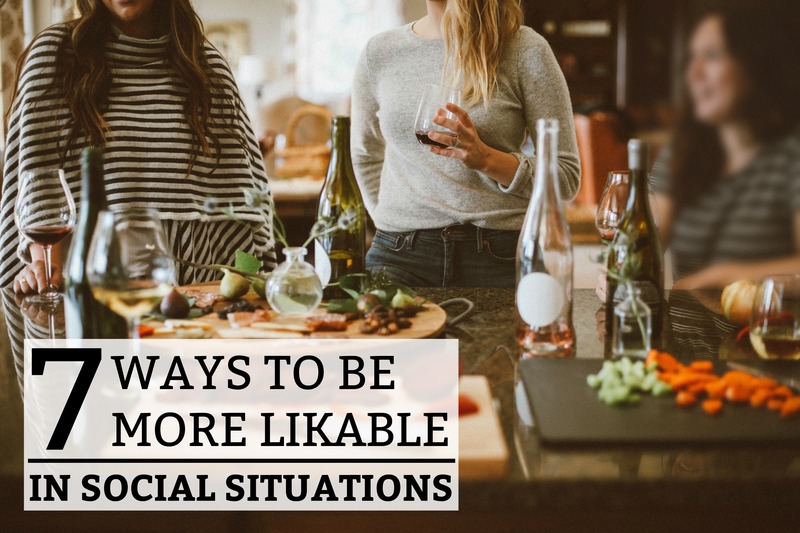 Below are the 7 ways to make yourself more likable in social situations – just like the pros! Although this tip isn’t 100% necessary to having someone like you, it certainly helps a lot! When you find something in common, it gives you a valuable connection with that person. It can be your love of dogs or the fact that you are both house-hunting. For my husband, it is often a love of sports or an interest in investments. For me, it is often a conversation about health, home decor, or future plans. As time goes by, and you get more practice with conversing with people, you will notice that certain topics resonate with almost anyone. If you meet someone who you don’t connect with easily, start asking open-ended questions about their background or interests. This way, you will likely find some common interests rather quickly. In the end, a common bond is a valuable way to built a friendly connection. That way, if you see that person again, you immediately have something to say to them! Although people can connect over both having a bad day, disliking the weather, or objecting to the same political viewpoint, it is never a good idea to allow an acquaintance or friendship to start with a load of negativity! The majority of people would prefer to be around a positive, uplifting person! Bringing up your negative opinions on a subject will certain alienate you from a lot of people – because life is already tough enough without talking to someone who brings down the entire mood of the room. Don’t be the wet blanket of the party! People will gravitate AWAY from you. Now I’m not talking about throwing in a little sarcasm or admitting when you had a bad day. Just don’t let negativity become what you are known for. This will become one of the main reasons you will lose friends. Focus on the bright side of things. There is always something to be positive about! Perhaps it’s your health, your steady job, your favorite TV show, your acquaintances new shoes, or the new restaurant that you tried and really liked. Find a way to be positive or don’t say anything at all! People will associate you with a positive feeling – resulting in you being likable. Don’t be that person who dominates every conversation! This doesn’t always mean that you are completely self-absorbed. Many people talk too much when they are nervous – and end up chasing people away. Remember, the whole point of attending an event is to get to know other people. Ask them questions about themselves and show genuine interest in the stories that they are telling. People can tell when you are waiting for them to finish talking, so that you can answer them or talk about yourself. Even if you are just trying to be more conversational, this makes you look insincere and self-absorbed. This is one of the signs of a toxic person and no-one wants that in their life! Most people love to talk about themselves – so indulge them! When you show a genuine interest in someone, that is a very likable quality! People love to hear their own names! A person’s name is a part of who they are. When you remember someone and use their name, it lets them know that they are memorable and that they have your attention. It builds an automatic connection. Don’t be afraid to ask a person their name a second time if you forget it right after you hear it. Hearing a name a second time can be a valuable tactic to remembering it the next time you see them. When you greet someone, use their name. Occasionally, during your conversation, also use their name. And when you say goodbye, use their name again. Just be careful not do over-do it. It can come across as annoying and over-bearing. We live in a phone-obsessed world! People are on their phones all the time – while at a restaurant, during a church service, in a business meeting, at a stop light, on a date, and even while giving birth! If you want to build trust with someone, silence your phone and put it in your purse or pocket. Nothing turns people off like being interrupted – mid-conversation. If you get a text while they are talking and turn your attention to your phone (even just a quick glance), you are letting them know that your cellphone is more important than them. Put your phone away and give 100% of your attention to the person you are talking to. This way, you are focusing all your energy on the conversation – something that will make you a much more likable person! Your facial expressions, gestures, tone of voice, the way you are sitting or standing, and your eye contact tell people a great deal about you! If someone doesn’t make very much eye contact, it is assumed that they are nervous nervous. A quiet, soft-spoken voice is also a sign of a lack of confidence. If someone slouches, they are minimizing their body and appearing uncertain and apprehensive. When you walk tall and confidently, people assume that you are prepared and confident. When speaking to others, look into their eyes. If you are talking to a group, alternate between each person. When shaking hands, grip the other person’s hand firmly and intentionally. When talking, speak clearly and at a slower pace. And smile warmly and self-assuredly at people! A smile signifies that you are a positive and happy individual! When I went out on my first date with my now-husband, I walked away feeling very special. How did he do that? He actively listened to me and asked engaging questions about my life and my interests. When he talked, his stories were interesting and funny! When I think about that date, I remember laughing, being listened to, and really enjoying his kind & genuine company. One thing I can say about my husband is that everyone loves him because he has an ability to make them feel special. They are drawn to his genuine kindness and honesty. It really is a gift! When you meet someone for the first time, take a genuine interest in THEM! Make eye contact with them, listen to their stories, and ask them questions. If you talk about yourself, make it relatively brief and applicable to the conversation. Then, steer the conversation back to them. This will make them feel important and appreciated. You do not have to be ungenuine to make someone feel special. Don’t compliment them unless you mean it. Don’t laugh hysterically unless they are genuinely funny. However, it is easy to give someone your attention and show an interest in them. I guarantee you, it will make you a much more likable person! At the end of the day, appearing likable has a lot to do with your confidence. Stop obsessing over what others are thinking about you and just be yourself! Simply put, when you treat someone with genuine respect and show interest in them, you are guaranteed to be a more likable person. Next time you go to a get-together, put these tips into practice and watch your social circle grow!